Twenty years ago, tourism to Medellin, Colombia’s second-largest city, was entirely unheard of. The world capital of cocaine production, Medellin was overrun with drug traffickers (none so feared as ruthless kingpin Pablo Escobar) and the cartel-backed street violence here was downright paralyzing. Proof of what’s possible in just two decades (Escobar was killed by police in ’93, and the city has been on a steady incline ever since), Medellin is slowly emerging as a dynamic urban center, with safer streets (though petty street crime is still a threat), innovative architecture and infrastructure, and a bevy of new museums, parks, hotels, and eateries. Freshly back from a week on the ground there, and just ahead of JetBlue’s new routes to Medellin (launching June 13), I've got some quick value-friendly tips on what to see and where to sleep in the "City of Eternal Spring" (a nod to its pleasant weather, year-round). Fernando Botero, Medellin’s most beloved son and Colombia’s most celebrated artist, donated over a 1,000 works of art (both his own paintings and sculptures, and selections from his personal collection of contemporary art) to the Museo de Antioquia (admission $5.50). Several floors are dedicated to Botero’s oeuvre, depicting his signature voluminous figures (look for the painting "The Death of Pablo Escobar," illustrating the drug lord’s ultimate downfall), as well as works by a collection of international and Colombian artists. Be sure to wander through the Botero Plaza, just out front (pictured above), where more than a dozen larger-than-life Botero sculptures sit plumply upon the square. For the most cost-efficient tour in town, hop aboard the modern elevated subway ($1) to board the Metrocable (at Acevedo Station), a newish mass-transit cable car system, where you can soar above one of the mountains surrounding Medellin, taking in sweeping panoramas of the city, it’s position in the midst of a mountainous valley, and the hillside favelas just below. Look out for the ultramodern Biblioteca España complex (free admission), which invigorated the former shantytown here in 2007 with a high-tech library and community cultural center. Get off at Santo Domingo, and continue up the mountain on yet another cable car ($2) to the Parque Arví (free) a sprawling mountaintop nature preserve with hiking trails and prime picnicking grounds. For one of the best values in town, book a room at the 61Prado: A European Guesthouse, run by a Dutch ex-pat with considerable knowledge of the area and gracious hosting skills. 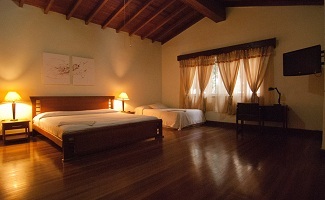 Clean rooms come with cable TV and free Wi-Fi; top floor units tout charmingly vaulted ceilings. Set in the Barrio Prado neighborhood, the hotel is an easy cab or subway ride to most of the city’s main attractions, though note the neighborhood can be a little dodgy after dark. Not to fret: The hotel offers security, an inexpensive honor bar (grab a drink and pop up to the rooftop for a great lookout over the city), and a fantastic little evening eatery with great-value dishes like delicious soups of the day ($2.50) and entrées highlighting a rotating menu of fish, pasta, and more (for around $7). Double rooms from $37/night; upgrade to spacious junior suites for $42/night.